Rhonda Price (RP) is the Senior Vice President of Talent at the Gersh Agency in New York. RD: How important do you feel it is for your clients to have a solid audition technique? RP: For the most part, I find this is extremely important. An actor has to be able to perform at a certain level in a room to get the job, especially as the stakes get higher with major feature film parts, television leads, and coveted theatre parts. If one is nervous or feeling "blocked," technique gives one the added confidence to hopefully move through it. An actor can be a bit off, but with technique, the person watching it doesn't need to know! Besides, other actors going up for the part who have that training will show it in the room; it can make all the difference. It also teaches one consistency. But I must say, I also represent people who are quite young or who started working out of the gate and didn't take an audition technique class. Some just know how to tap into that special area of themselves. RD: What is the single most significant piece of advice you can give your clients about professionalism and auditioning? RP: Be on time, be prepared, look the best you can, and own the room without being rude or arrogant. It's hard enough to audition—to be in a situation to be judged. Don't go into that room with a strike against you, where you have control. RD: How hard is it for you when you know that you have an actor who is very right for a role, and the feedback is negative after he has his audition for that role? RP: Extremely. First, I ask the client how HE feels he did. I want to see if he feels the same way, or feels he did a great job. I always take into consideration what the feedback is and who it is from, as well. There are times when a casting director says lovely things to the actor in the room, and then calls me with a completely differing opinion. I think it is important to have a bead on what happens in the room with your client, but also to acknowledge you are not in there with him, so it's really about making sure he is present in the room and doing his best work. In the end, I say to my clients, "As long as you have done your very best, and you have no regrets as to those five or ten minutes or half hour in the room, you have won." But I won't lie—I do get frustrated . . . I want my clients to work! RD: Is that the casting director's fault or the actor's fault? RP: It can be both. If a client is not prepared, it's his fault. Ifit is an adjustment that can be given and is not, then I think that is the casting director's job. If the casting director gives a note and the actor doesn't fully realize it, that's a toss-up. Sometimes actors need time to process, and sometimes they can take it in and process it right away. That goes back to technique—being in the moment and feeling secure and listening. RD: Do you encourage your clients to get training and keep studying the craft of acting? RP: ABSOLUTELY. We are all students of what we do. There is always something to learn and explore. Many of my most successful clients are the ones who are still in class. I often chuckle at those that feel they did a year or two in a conservatory or have a Master's degree, and think that is enough. Actors feed off of other actors. 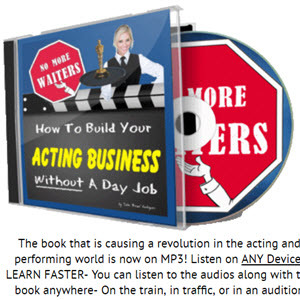 Actors learn when working and when not working. It extends beyond actual class and private coaching. It's about expanding your knowledge via books, old movies, theatre, dance, music, politics . . . and most importantly, working on your inner self. It's all about tapping into that place in yourself that makes your work full and unique to you. RD: Do you ever work with your clients before their auditions? If yes, why? If no, why not? RP: I do. I work with a lot of my clients in our tape room, so I know them and they know me. It gives them the chance to work aloud, and they know my comments come out of love and respect and a desire for them to get the job. I always say, "I AM NOT AN ACTOR; I HAVE NEVER TAKEN A CLASS," but I know what it feels like to be affected by someone. Let's do the scene; affect me. Some clients hate it—makes them nervous! RD: What is the key to a sustained career as an actor? Not a famous career, but what does it take to be a working actor? RP: I wish there was an answer for that—I'd feel like I had the keys to the kingdom of the acting G-d. To me, I think it is about knowing that like anything in life, it's cyclical. You can't be on top every moment of your career. But when you are good, when you have a talent that the world responds to, have faith. And always work on your personal self. Growth in one's brain and soul deepens work as much as "acting like you are a tree" . .. not that there is not value in that exercise! But most of all, if the process and the work still give you the joy and a satisfaction, and you still have the undying passion of not wanting to do anything else, that's a big part of it. We all have different thresholds for pain and gain, and for what is a successful, sustained career.